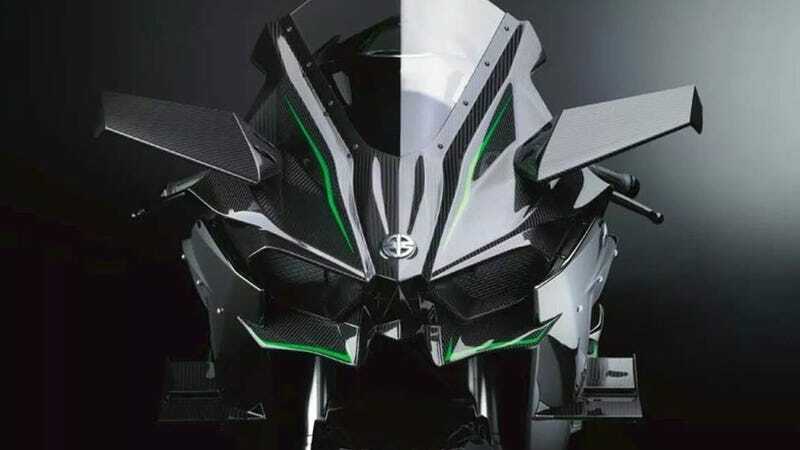 We're less than 24 hours away from the debut of the Kawasaki Ninja H2 at the Intermot show in Cologne, Germany, and here's the first real shot of the supercharged beastie. And yup, it has wings! With an unending string of teasers, we finally get a clear view of the H2, and while we can still endlessly speculate on the size of the blown inline-four, the suspension setup, or power figures, it's the wings that have our attention. While wings aren't anything new on top-tier racing bikes like those found in MotoGP, the H2 looks to be the first with side wings on a production bike. But it's not for downforce – it's for cooling.